Acetic acid may not be a household name to many, but it’s actually a relatively common chemical. As a vital chemical in the industrial industry, acetic acid is used for a variety of purposes in many countries around the world. You may even encounter acetic acid in a diluted form in your own house, or it might be a chemical you handle at work. In either case, it’s important to handle this potentially hazardous and corrosive acid with appropriate care by following these safety tips from our MSDS experts. Acetic acid is also used in the production of several other chemicals, which are then used to make preservatives, fungicides and pesticides, coatings and pigments. Acetic acid can be a hazardous chemical if not used in a safe and appropriate manner. This liquid is highly corrosive to the skin and eyes and, because of this, must be handled with extreme care. 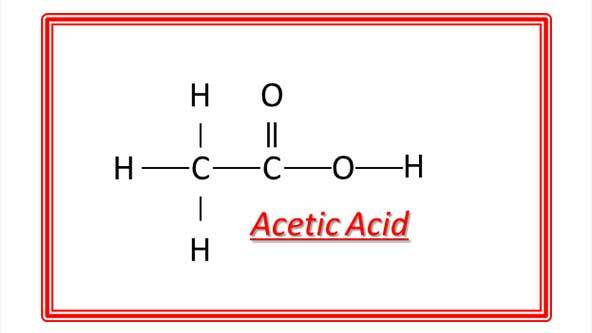 Acetic acid can also be damaging to the internal organs if ingested or in the case of vapor inhalation. The use of PPE (personal protective equipment) is essential when handling this chemical in an undiluted state. Ensure that eye-wash stations are nearby if handling acetic acid. In the event of a large spill in either the workplace or at home, a self-contained breathing apparatus should be equipped, and you should also wear a full protective suit for additional safety. If you do not have this equipment readily at hand, do not attempt to clean up the acetic acid without it. Exposure to acetic acid can pose serious hazards to your health. This chemical is especially dangerous when it comes in contact with either the skin or eyes. In any instance of acetic acid exposure, it is important to seek help from a medical professional right away to help prevent damaging health effects. Skin Contact – Immediately flush skin with water for at least 15 minutes and remove contaminated clothing. Cover the irritated skin with an emollient. In case of serious skin contact, wash using a disinfectant soap. Seek out medical attention as soon as possible. Eye Contact – Remove contact lenses right away if present. Immediately flush eyes with plenty of water for no less than 15 minutes. Seek medical attention immediately. Ingestion – If acetic acid is ingested, do not induce vomiting. If victim is unconscious, do not administer any mouth-to-mouth resuscitation. Loosen any tight clothing. Seek medical attention immediately if any symptoms appear. Inhalation – If inhaled, seek fresh air and medical attention immediately. If breathing is difficult, administer oxygen. If breathing is absent, give artificial respiration. Acetic acid should be stored in an approved area away from heat or other sources of ignition. Keep away from incompatible materials including oxidizing agents, reducing agents, metals, acids and alkalis. Store acetic acid in a cool, well-ventilated area in a tightly sealed container. This chemical must be disposed of in accordance with federal, state, and local environmental regulations. Here’s a great resource for safety compliance information. Safety is of the utmost importance when handling potentially dangerous chemicals such as acetic acid. This corrosive liquid should be used with care, both in the workplace and in household products. For more information about acetic acid uses, safety, or disposal, search our database of MSDS information.